Dorothy “Dot” Eck, 88, of Norris City, passed away at 4:40 p.m., Thursday, February 8, 2018 at the Linda White Hospice House in Evansville, Ind. She was born in Detroit, Mich. on March 23, 1929, the daughter of Albert Joseph and Eva Mona (Yokum) Theisen. Dot had worked at Doug’s and the Wonder Market and more recently at the Norris City Library and the White County Senior Citizens. 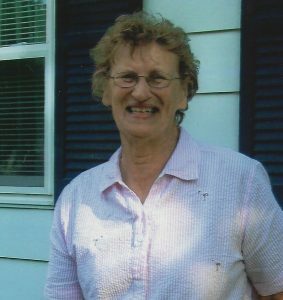 Dot had many hobbies, including photography and joke telling, she was an avid painter, writer of poetry, loved quilting and sewing, working word puzzles, playing cards and games and loved nature. Dot is survived by three sons, Dan and Roxane Eck, of Springerton, Steve and Kim Eck, of North Bend, Wash. and Joe and Deborah Eck, of Virden, Ill.; daughter, Diane and Jerome Naas, of Cottonwood, Ill.; 10 grandchildren, Danielle and Heath Short, Ryan and Lacy Eck, Jeremy Ionson, Alex and Dustin Howie, Monica Rosenberger, Brandon Eck, Kory and Jennifer Naas, Rick Naas, Kinsey Naas and Jarod Nichols, and Alexa Naas; 12 great-grandchildren, Wyatt Ellison, Aiden Allen, Gabby and Emme Short, Brier, Blane, Bryce and Mallory Eck, Dawson and Beau Howie, Emmett Norris and Karver Naas. She was preceded in death by her parents, her brothers, Albert and Robert Theisen, sister, Ilene Theisen, two sisters-in-law, Kay and Patricia Theisen, and a beloved granddaughter, Amy (Eck) Ellison and a great-grandson, Henry Norris..
A Celebration of Dot Eck’s life will be held at 4:00 p.m., Sunday, February 11, 2018 at Campbell Funeral Home in Norris City with visitation from 1:00 p.m. until service time. Burial will be in Cottonwood Cemetery at a later date. The family has requested that in lieu of flowers, donations be made in Dot’s memory to the White County Senior Citizens Center in Carmi or the Linda E. White Hospice Center in Evansville, IN and will be accepted at Campbell Funeral Home in Norris City.